This year's SCBWI conference in Winchester was tremendously inspiring for book creators of all kinds, and notably so for artists. As this year's Illustration Showcase gallery goes online, here's a roundup of what happened for illustrators. This year's Winchester Conference took place on 1st-2nd November. On one of the warmest Novembers on record, illustrators got off to a good start with an open air Halloween sketching activity before the Conference run by Paul Morton. Participants were given random spooky phrases to illustrate, and although I could only stay for a short time I had the chance to see a lot of suitably spooky sketches. Once the doors of the Conference opened we were treated to the first delight - big congratulations to the 24 artists selected to participate in the 2014-2015 Showcase Exhibition! This year we were overwhelmed by the amount of quality entries and it was a tough decision for the judges to select the final shortlist. The selected pieces generated a lot of interest from the conference-goers and faculty alike, many prints ordered by attendees, raising an impressive total of £580 for the charity War Child. All the images are now visible online in the web-gallery. The showcase will be touring across the country over the next year. 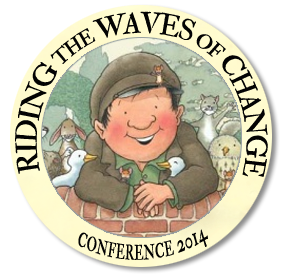 Check the SCBWI British Isles website and social media for updates on the locations and dates as they develop. 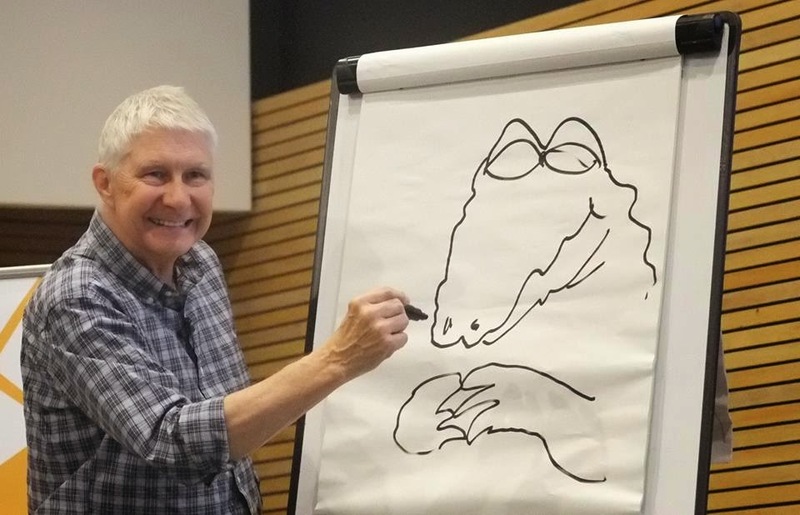 Our illustrator's keynote this year was acclaimed author/illustrator Nick Butterworth, creator of Percy the Park Keeper, Q Pootle 5 and a host of other bestselling characters. I think everyone who attended will agree that he was a simply marvellous presenter, entertaining, in depth and revealing. On the central stage Nick gave a fascinating and very funny relation of his career, the inspirations for his bestselling books and how they were developed. In a second Q & A session he went into more fascinating detail of the issues faced in developing stories for animation and his art techniques, including the joyful news that his favourite drawing paper is back on the market after years of unavailability. These are the kind of details that illustrators love to hear! If you missed Mike Brownlow's fascinating interview with Nick read it here. The weekend workshops got off to a fine start with an Industry Panel discussion on the state of publishing for picture books, featuring Louise Jackson (Walker), Sam Arthur (Flying Eye), Eric Huang (Made by Me) Jude Evans (Little Tiger) and agent Penny Holroyde. Hosted by Mike Brownlow, the discussion was a fascinating coverage of the current state of publishing and market for illustrators, with each panelist explaining their processes of selection, preferences and thoughts regarding the future. 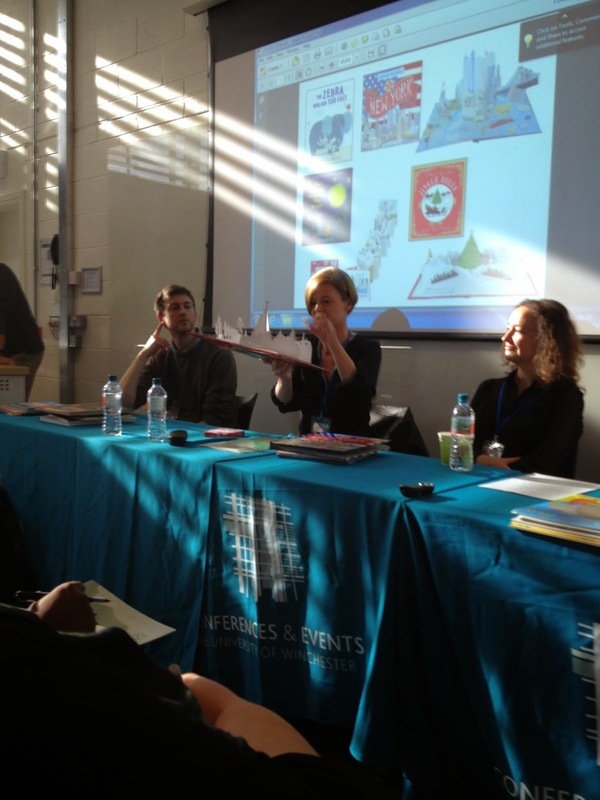 There were two workshops which focused on picture books at the Conference. 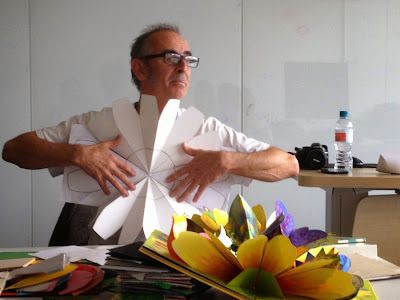 The first was run by the wonderful Paul Stickland teaching the art of the pop-up book. Participants were guided through the stages of engineering and technical challenges presented by pop-ups, and over the course of a day created their own sample characters. At the same time, illustrator Mike Brownlow joined with publisher Jude Evans of Little Tiger Press to host a workshop on developing picture book plots. Participants were split into teams of three and given a series of suggested prompts to form the basis of story ideas. Each group was encouraged to use teamwork to develop stories, and at the end everyone presented their ideas and work, some of which were really excellent. One of the most fantastic bits of news at the Conference was that Anne-Marie Perks has won the Member of the Year Award. The announcement took place at the height of the Saturday evening party. 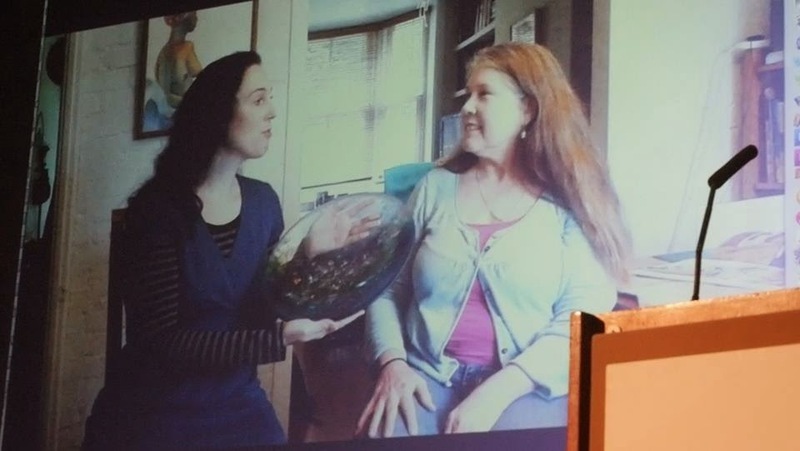 As Anne-Marie is currently out of the country, conference-goers were entertained by a recorded video interview. 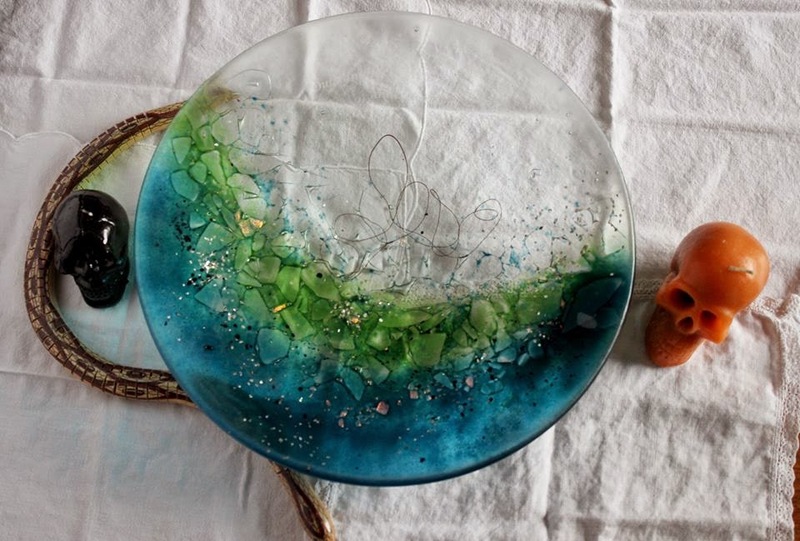 Anne-Marie has dedicated years as Illustrator Coordinator for the British Isles chapter, initially working alone, organising and promoting activities for artists within our chapter. Now, with a support committee of dedicated volunteer illustrators, things are developing even further for illustrators in SCBWI. This is all thanks to the dedication and hard work of our Illustrator Coordinator. Well done Anne-Marie! A video of Anne-Marie accepting the Award from Loretta Schauer was broadcast at the Conference. There were 20 minute individual illustrator reviews available with one of five industry professionals: Jude Evans of Little Tiger, Penny Holroyde of the Caroline Sheldon Agency, Louise Jackson Art Director at Walker Books, Sam Arthur publisher of Flying Eye and Nobrow and experienced author-illustrator Mike Brownlow. 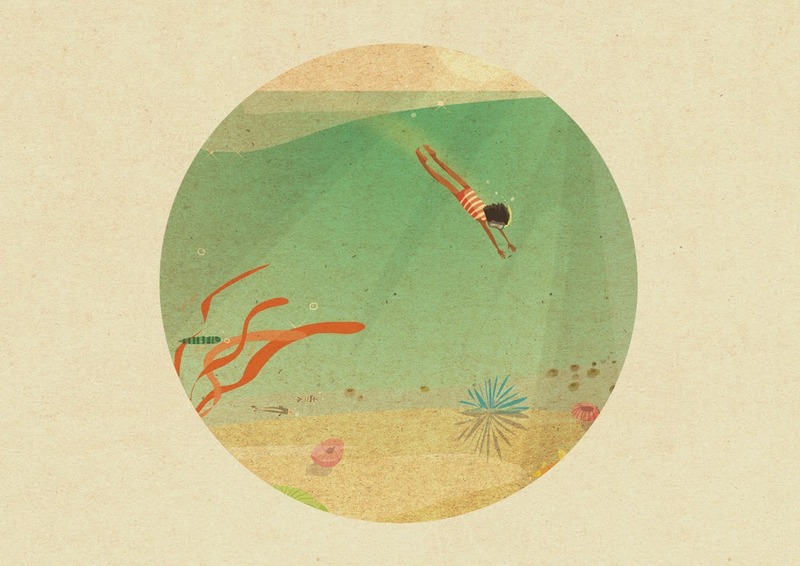 If illustrators and author-illustrators need some objective and positive advice about where to go next with their work, a personal review is well worth the extra cost. Melany Pietersen for Best Portfolio, selected at the open portfolio display. Jion Sheibani in the "My Creative life" comics competition, for her comic series "ProCATsination", currently being serialised on Words & Pictures. Congratulations to everyone involved in Winchester. 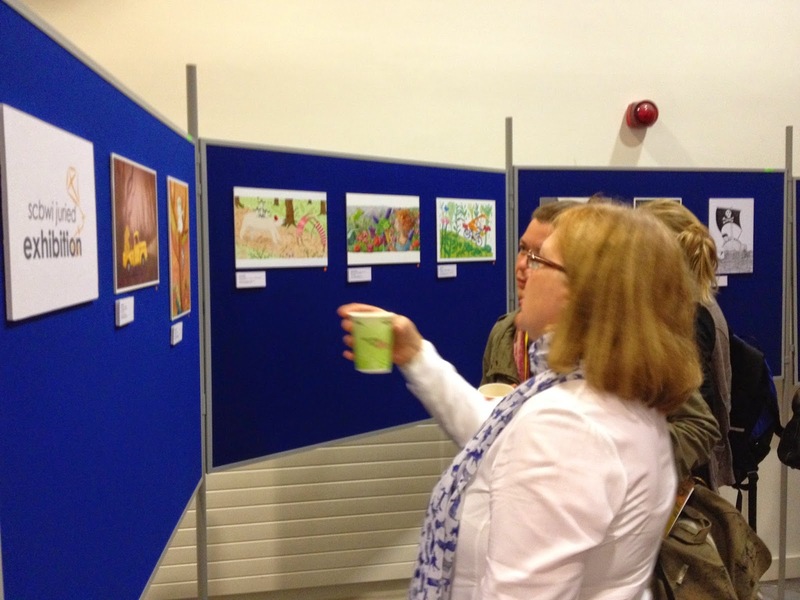 It was a marvellous conference with excellent presenters and some fantastic artwork on display. The Conference was full of inspiration for illustrators, both those starting out and seasoned professionals. Check the British Isles page on the SCBWI website to keep up to date with more exciting Illustration Masterclass workshops over the coming year. If you'd like to get involved with illustration activities in SCBWI, volunteer for the illustration committee, or write illustration features for Words & Pictures, get in touch! Good to have this reminder of what I think was a really insipiring conference. The new Illustrator Showcase is off to a great start and will be showing at Seven Stories in the autumn of 2015. What a great round up John, particularly good to get an insight on the illustrator and picture book sessions which always look such fun, I wonder why I don't go to them! Yes the hands-on PB session with Mike Brownlow and Jude Evans was particularly useful. I teamed up with 2 writers, Kate Peridot and Rachel, and by the the end of the 2 hour session we had a very reasonable PB idea about the Battle for Trafalgar Square. Can't say more at the moment as we are still pursuing this idea post conference.